Just a quick little post from me today, I thought I would share some makeup bits that I'm reaching for at the moment, a look that would be nice for the festive season or a Christmas party! Lots of glowing skin, golden eyes and a sparkly red lip! For base I've been sticking with my L'Oreal Infallible 24 Hour Foundation which gives really nice build-able medium courage. I've been using my old favourite Collection Lasting Perfection Concealer, which has great staying power. For powder I've been using this Catrice Colour Correcting Powder, I like this in the winter as it corrects all the redness on my face. For blush I've again been using an old favourite, the Max Factor Creme Puff Blush in Lovely Pink, it's a gorgeous dusky pink with golden shimmer. For highlighter I've recently discovered the Kiko Radiant Touch Creamy Stick Highlighter, a little hard to blend but it's super creamy and creates a gorgeous glow. For eyes I've picked the Rimmel Scandaleyes Eyeshadow Stick in Golden Bronze, great for an all over wash of colour and it blends in really well. For eyeliner, I've gone for a favourite liquid eyeliner, the Soap & Glory Supercat, it's really precise and super dark. Onto mascara I've been obsessed with this Maybelline Lash Sensational one recently, so much length and volume! I forgot to photograph my brow choice but it's the Soap & Glory Brow Archery which I've been using for a while and love! For lips I picked out a new favourite, this Tanya Burr Lipgloss in the shade Bewitching, which I got from her Deck the Hauls Advent Calendar, this gloss is gorgeous and shimmery, and a beautiful deep red wine colour, lots of colour pigment. Finally to make it last all night I've been using the Urban Decay All Nighter Makeup Setting Spray which is just amazing! 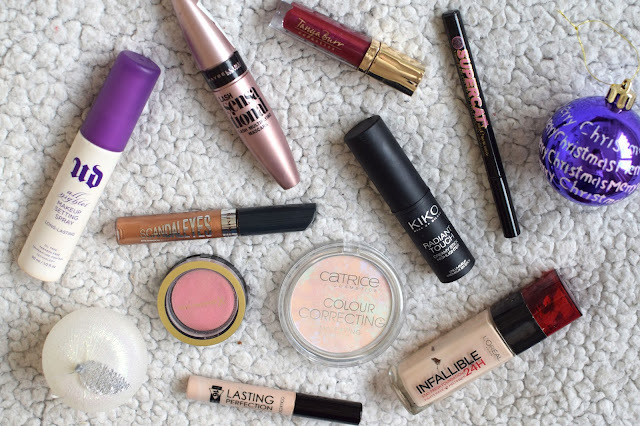 What are your festive makeup picks? The Collection concealer is a great one - so many bits here I now want to try out! Supercat and Lash Sensational are my dream pairing right now, they both make me look far more skilled at eye makeup!